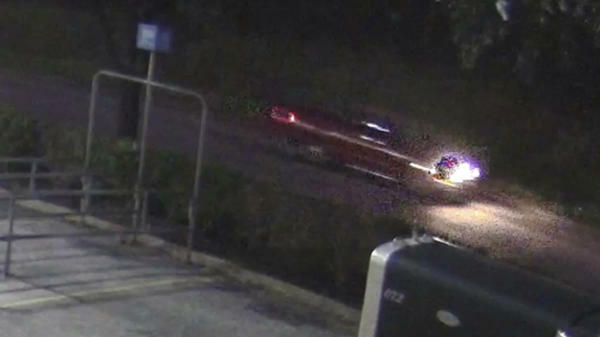 An image taken from surveillance video of a pickup whose driver, according to authorities, fired several shots into a car carrying a family near Houston, killing a 7-year-old girl. "We're not going to let up," said Harris County Sheriff Ed Gonzalez at a Monday press conference. They released a still photo from a surveillance video showing the suspect's vehicle. As of Wednesday, the sheriff's office hadn't released any additional information about the case or any possible leads. The sheriff asked local residents and businesses to review surveillance footage and look for the man and his four-door truck. "My hope is that every passing moment, that his conscience is eating away at him," Gonzalez said, asking the suspect to turn himself in. Police have reportedly interviewed Barnes' siblings, trying to get a good description of the suspect. In a tearful interview from her hospital bed Monday, Barnes' anguished mother said the man pulled ahead of their car after shooting, and then opened fire again before driving off. "It was not fair. He intentionally killed my child for no reason," Washington, who has since gone home, told reporters. "He didn't even know her, he didn't know who she was." Washington said she had turned the moments before the shooting over and over in her mind. "Did I cut this man off? Did I turn in front of him? ... Did I do anything wrong to cause this man to fire shots in my car?" she said. "I didn't, I didn't do anything." Gonzalez called the shooting "totally unprovoked." Barnes' father, Christopher Cevilla also made an emotional plea for information about the suspect. "I just really want the public to step up in this tragic time and help me and my family and loved ones get justice for my daughter," Cevilla said at the Monday press conference. He described her as "loving, caring, very passionate with people, very sweet, just an innocent young girl." Police haven't yet pointed to a possible motive for the killing of the African-American child. Gonzalez has said authorities aren't ruling out any possibilities, including that it could be a hate crime. A local chapter of Black Lives Matter and others have suggested that the killing was racially motivated. On Saturday, community members say they will gather for a rally at the site of her death. Earlier this week, author and activist Shaun King announced a reward — which he has since raised to $35,000 — for information about the suspect's whereabouts.